1. Skip a wash (or a few!). You've heard it before and you're going to hear it here again washing your hair everyday isn't good for it; constant washing strips your hair of its natural (conditioning) oils, drys it out, and leaves you prone to more damage. Now I'm not saying to never wash your hair, but try your hardest not to wash it every time you shower (aka everyday); I aim to wash my hair 2-3 times a week depending on my activities and how it's looking. Get yourself a good dry shampoo, my favorite is Batiste in Coconut and Exotic Tropical scent (it's smells so yummy! ), and there are countless others available so the trick is just finding one you like to spruce up your locks between washes. Also if you're worried your hair will be more oily if you don't wash it all the time, in the beginning it will be (baby powder and dry shampoo can help with that though), but your hair will "train" itself to be less oily overtime and the results are well worth the transition period, trust. I am huge on avoiding using products with sulfates, silicones, and alcohol in your hair. Sulfates are harsh chemicals that can strip your hair and skin of natural oils, lead to dry skin, and cause irritations (I can attest to this first hand). Since I've switched to sulfate free shampoo, a more mild way to cleanse your hair, I've seen a big difference in the health of my hair, including my scalp, which is no longer red, dry, or itchy. My favorite sulfate free shampoos are L'Oreal EverCrème, Not Your Mother's, and Living Proof PhD. Silicones are used in most anti-frizz products, but I like to avoid them because they can actually build up on your hair and eventually make it frizzier; for anti frizz products without silicone try EverSleek Frizz Taming Crème Serum and Living Proof No Frizz Nourishing Styling Cream. Lastly, I try to avoid alcohol as much as I can because it can really dry out for your, but sometimes this is hard to do when a hairstyle calls for hairspray. 3. Use a clarifying shampoo. A good (sulfate free) clarifying shampoo will help to rid your hair of any buildup that occurs from the products you are putting in your hair. Using one creates a clean slate for your products so that they can work better and it's a great breather for your scalp. It's best if you use a clarifying shampoo only once every three to four weeks or else you run the risk of drying out your hair. My new favorite clarifying shampoo is Not Your Mother's Clean Freak Purifying Shampoo and I'm also dying to try Aveeno Pure Renewal Shampoo. Deep conditioning your hair is vital to keeping your it moisturized and healthy. Keeping your hair well moisturized can help to prevent split ends, repair existing ones, reduce them, and make your hair soft and silky. I've found that deep conditioning every seven to ten days has really helped to improve the look and health of my hair. My favorite deep conditioners are Living Proof Restore Mask Treatment, Clairol Hair Food Moisturizing Mask, Queen Helene Cholesterol Hair Conditioning Creme, and this DIY Honey Hair Mask. 5. Get a wide tooth comb. Your hair is most fragile when it's wet, which means it's most prone to breakage, something you must try to prevent at all costs. You shouldn't just run a brush through wet or damp hair because that is how you will damage it, instead you need to gently brush/detangle it with a wide tooth comb because is easier on your hair; you can also try The Wet Brush, a brush specifically designed to easily and gently detangle hair, in place of a comb. A comb is also important to help evenly distribute conditioner through your hair, in the shower use the comb after you apply conditioner or deep conditioner to make sure each strand is covered. 6. Use what's in your kitchen. Using ingredients found in the kitchen is my favorite ways to make treatments for my hair. It's amazing just how many food items have incredible benefits for your hair - eggs, baking soda, avocado, olive oil, and more can all do different things for your hair. Check out Pinterest, beauty websites, and here for different ways to use food to help the health of your hair. 7. Coconut oil is your best friend. I am obsessed with using coconut oil in my hair! It has a few different uses and is a great way to moisturize your hair. When I know I'm going to wash my hair in the morning I rub some coconut oil into my ends to give them some extra moisture. Additionally, You can take a little coconut oil and rub it on your ends before showering to protect them from shampoo drying them out. I also love to section my hair and saturate each section in coconut oil, braid it, and sleep in it overnight to give it a really deep conditioning, when I wash my hair the next day it is always ridiculously soft and silky. Moreover, coconut oil is great to mix with different things to create hair masks with many different benefits. Lastly in a pinch (or if you're more into natural beauty) a little bit of coconut oil can serve as an anti frizz treatment, just put a small amount on damp hair like you would any other anti frizz product. I'm not going to lie to you, I hate the way my hair looks when I let it air dry, but taking a break from the heat from time to time is a necessity for healthy hair. When I'm going to let my hair air dry completely I usually put it in a braid when it's about seventy five percent dry so that it gets a nice wave to it or I can just rebraid it when it's dry for a chic braided hairstyle. Even when you are going to blow-dry your hair it's important to let it air dry before blow drying or you will damage your hair even more. I let my hair air dry fifty to seventy five percent of the way before drying it, which has really helped to keep my hair healthy; a bonus is that you spend less time blow drying your hair and having to hold up the heavy blow dryer. If you want to prevent damage using heat protection spray is an absolute necessity before using any heated styling tools. My favorite heat protection spray is TRESemmé Platinum Strength Strengthening Heat Protect Spray; spray damp strands before blow drying, and then spray dry hair before flat ironing or curling. 10. Give yourself a trim. 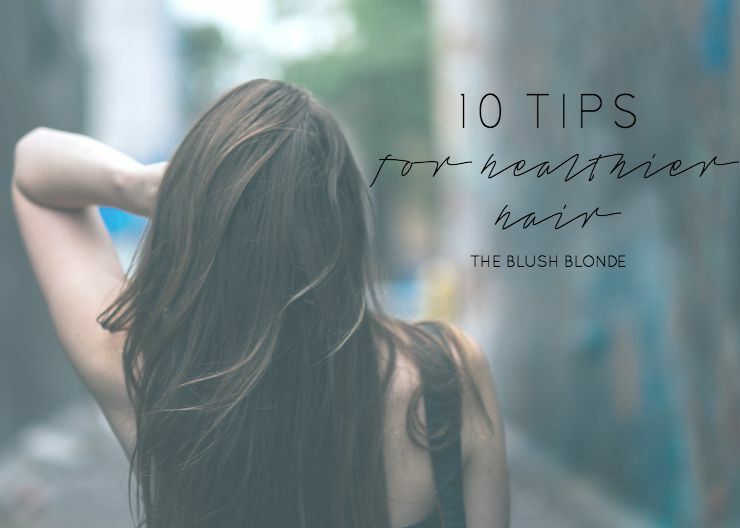 Everyone says that in order to keep your hair healthy you need to get a trim every six to eight weeks, but since hair doesn't grow that fast, only about half an inch a month, if you trim your hair that often you will land up constantly cutting off your new growth. However split ends will ruin your healthy hair, so you do need to get rid of them and the best way to do that is by giving yourself a trim by cutting off just the split ends. Is this time consuming? Yes, but it's definitely worth it and it's the perfect activity to do while watching a show or a movie. Learn how to do this from Cara of Maskcara here. What are your best tips for keeping hair healthy? Today I'm linking up with Tutu Tuesday and Confident Twosday. Welcome to the first ever Tutu Tuesday Linkup hosted by myself and Jordyn of The Fairy Princess Diaries we are so so so excited to have you! My favorite part about the link up is that there isn't one specific topic so I'm really looking forward to a variety of different posts and seeing just what you all have to share with us. We're hoping to make Tutu Tuesday's a fun party that you look forward to linking up to. Every week Jordyn and I will be featuring our favorite posts from the previous week, which means every week you have two chances to be featured! Our goal here is to create a community of bloggers where we can all connect, find new blogs, and support one another. We love new friends, supporting other blogs, and meeting fellow Girl Bosses! One last thing before you link up, to celebrate the launch of Tutu Tuesdays we are hosting a giveaway tonight on Instagram, which will begin at 7 pm EST so follow us on Instagram and keep an eye out for that! 4. Have fun & mingle with other bloggers that have linked up! Like I said we want everyone to make new friends! Coconut oil is the very best! I aim for a wash about 2-3 times a week as well, and recently started air drying a bit more...it's still not my favorite look, but at least I know I'm keeping my hair healthier! I always try my best to use chemical free hair products and I was my hair 2-3 times a week. I dye my hair a lot so I'm very into taking care of it. These are the best tips! EXCELLENT TIPS!!! I'm totally bookmarking this post, haha! 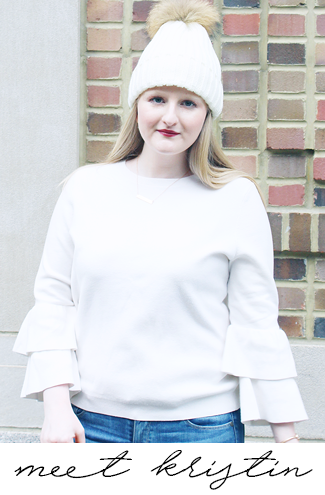 Stopping by from the Confident Twosday link-up! These are all fabulous tips Kristin! My hair is always so damaged and to be honest I am not the best at protecting it. I use a really great moisturizing shampoo and conditioner but I need to start combing (instead of brushing) it when it is wet. I literally rip through my hair each night and I know it's horrible for it! Great tips, Kristin! I don't have a comb but I do have this 'detangler' brush that I think serves the same purpose. It's such an incredible tool! It's supposed to not pull out as much hair but it's great for taking out knots without any pain what-so-ever. Great for kids (and me)!